Dodge does not have an extensive history of making compact cars. 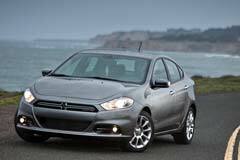 Among those smaller models it has produced, a used Dodge Dart would be an example of a reliable car. The four-cylinder Dart offers excellent steering design allowing it to handle very well on the road. The 2.0-liter four-cylinder engine offers 160 horsepower and 148 pound-feet of torque and a six-speed automatic or manual transmission. Features to this vehicle are somewhat sparse, but the blind-sport warning systems and dual-zone climate control systems are definitely appealing. Overall, this is a car known for offering good performance and driving. The performance allows it to stand out from other smaller cars on the market. In actuality, this compact car is a bit bigger than other smaller vehicles produced by other manufacturers. The interior is not very spacious and the front seats can be a little cramped. For those looking for fuel economy and decent handling in a smaller car though, the Dodge Dart definitely can be a good selection. 1966 Dart -- Meticulously restored from ground up!